NOTE: Apologies to all who were expecting to follow our trip on a daily basis, but if you haven’t figured it out by this time, I was physically unable to write these posts as they were occurring, due my fatigue each evening, as well as some challenging internet connections via several different WiFi hookups. In some cases, the WiFi would only work in noisy lobby or bar areas. This was simply not conducive to concentration, nor did it provide the comfort to be able to type on my tablet — important considerations for me. So, the posts are all written after I returned home and could gather my photos as well as my thoughts. Hope you still find them interesting. I shall date the posts as they occurred in actual time. September 6, 2015: Toast, jam, and two OK “cafe Americanos” served by a gruff bartender in the Hotel Gaudi bar started our morning off before we stepped out into a beautiful sunny day in Astorga. Wihin minutes we were to the outskirts of the city past Puerto Obispo and headed over the freeway A-6 but not before stopping at a small medieval hermitage called Ecce Homo. We entered the tiny chapel and received a sello for our credencials. 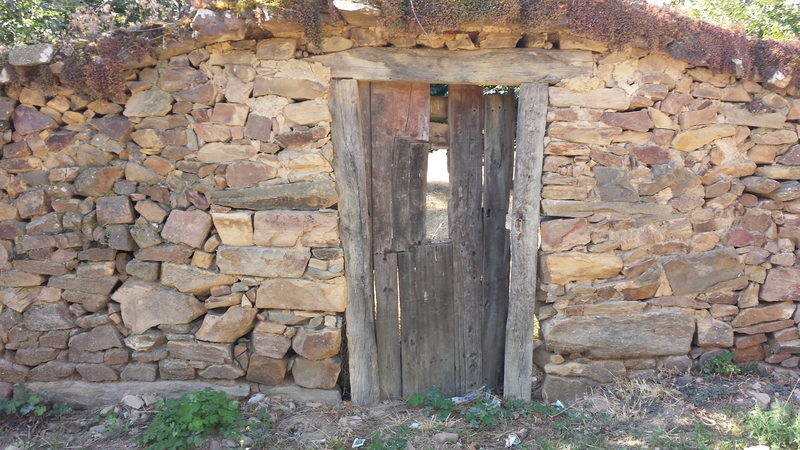 Soon, the city environs gave way to countryside and we made it to Murias de Rechivaldo within an hour. 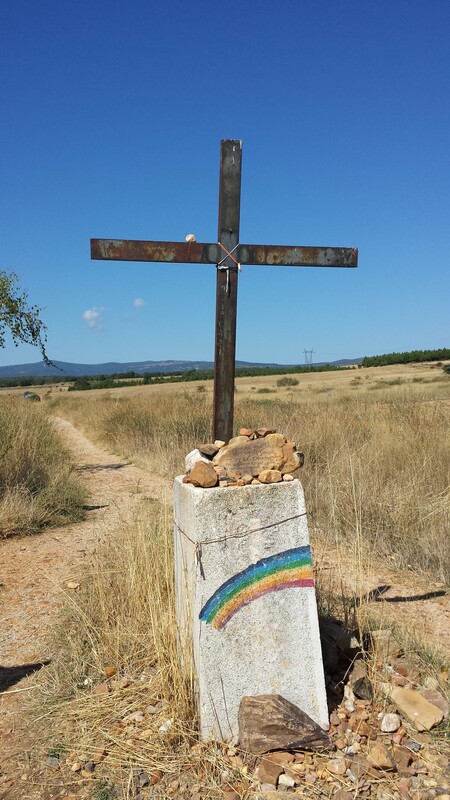 It was here that we hoped to veer off to Castrillo de Polvazares, but we must have missed the turn and by the time we exited Murias, it was too late to change directions. Besides, that would have violated one of my core Camino principals: “never go back” because it’s just that much further to get to where you are going. In spite of the urging from Christine, Castrillo would have to wait for another trip. Santa Catalina was next. Before we got there we met Vic and Heather from Australia, and of course became instant friends as we walked along for several kilometers. We stopped for a short while to rest our feet while Vic and Heather waited for their friends (two other couples) to catch up. At the outskirts of Santa Catalina we ran into Claude and Lita, the French couple from dinner in Mazarife. 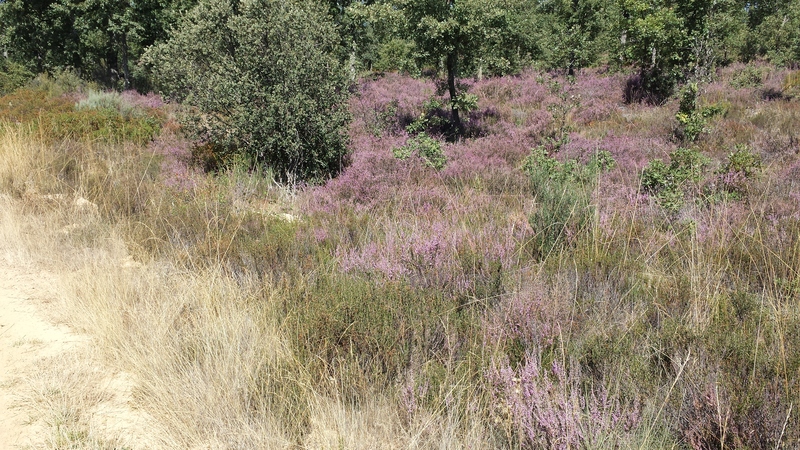 Since they appeared to want to walk alone, we left them and continued on along a beautiful long trek up sandy trails through magnificent countryside. 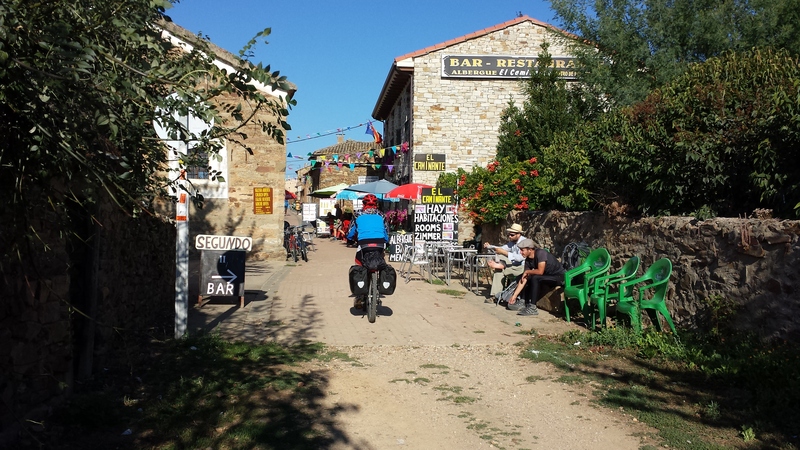 When we got to the crumbling village of El Ganso we stopped for some refreshments in a cafe next to the Cowboy Bar. Heather and I both had Bocadillos con Queso. To our surprise the sandwiches were fresh and delicious. 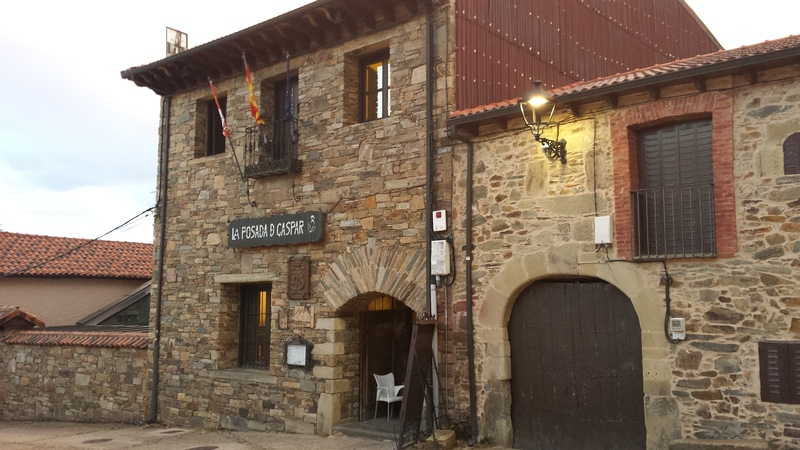 This was to become a staple for us in the days to come along the Camino. 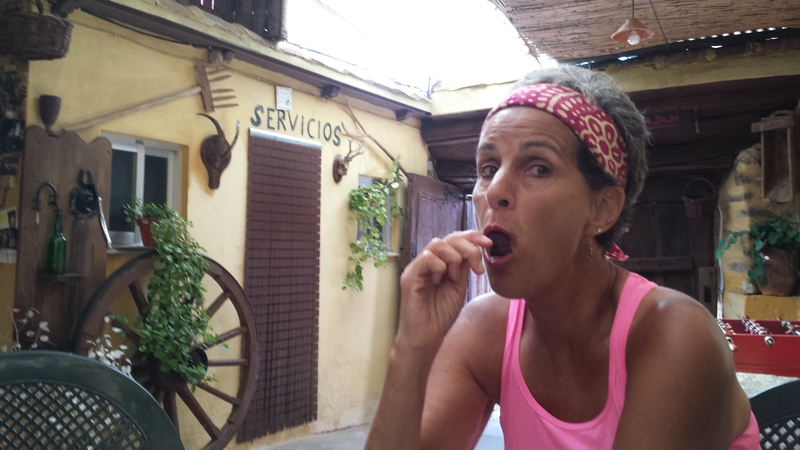 Heather finished off her lunch with a chocolate Helado popsicle! Hey, you can eat these things when you are burning off so many calories along the way! 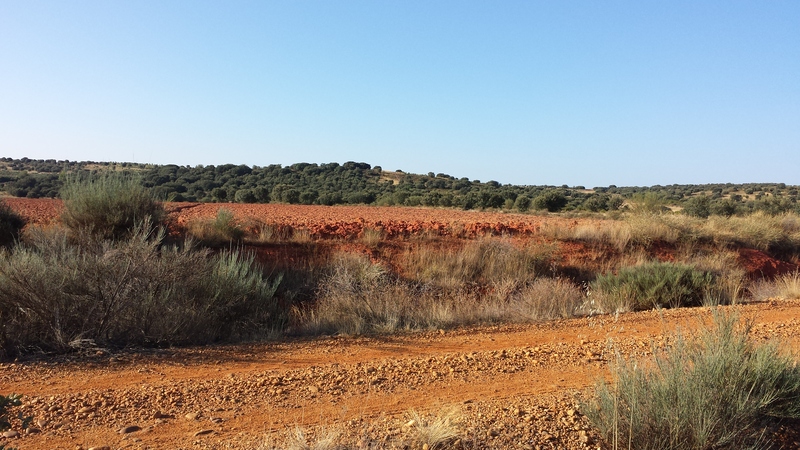 The rest of the way up to Rabanal was just a delightful walk, albeit a long one. At one resting point, a British chap came over to us with some fresh watermelon and sliced off a piece for us — cold and quite refreshing. He said he had picked up a bottle of wine and a chunk of watermelon in El Ganso and was planning on a great lunch. We could not imagine taking on that much weight to carry, but chacon a son gout! Heather’s hip was bothering her, but she stopped often to stretch it out, and that seemed to help. 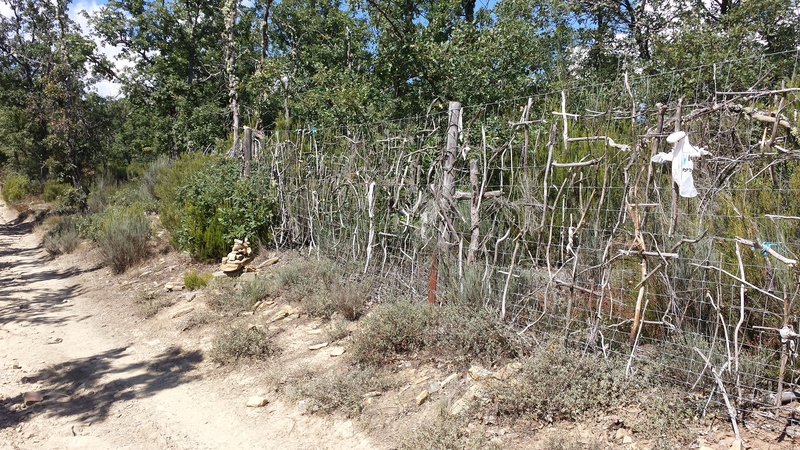 Before entering Rabanal, we traversed a wooded area with a steep climb, fenced on one side. The fence is strewn with crosses fashioned into it. This is an extraordinary sight, and we stopped to photograph several of them. 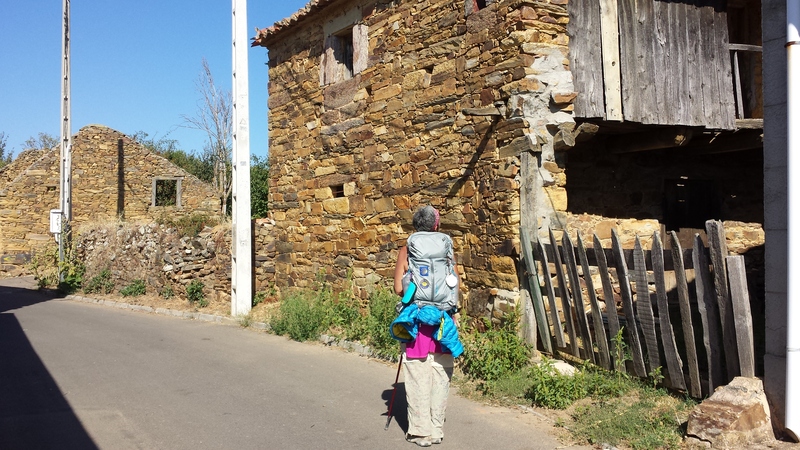 Reaching Rabanal we climbed the steep main street to our pension La Posada de Gaspar and settled in for the night. At dinner, we were surprised to see Vic, Heather and all their Australian friends as well as Claude and Lita — all of whom appeared to be staying at Gaspar as well. I’m so glad I will be able to follow your wonderful trip. Congratulations on your accomplishments!